Ideal for use in general purpose scientific applications requiring size, structure, morphology and chemical composition of aerosol particles, the Aero Select can be used for in-situ sampling of airborne particulates in order to risk assess exposure. Able to determine the concentration of contaminate particles in man-made applications against a background of naturally occurring aerosols from processes such as combustion, to assess the health risks related to exposure. 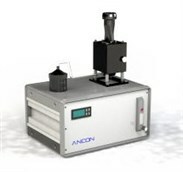 The Aero Select has been proven to distinguish low levels of a target substance against background atmospheric aerosols by up to a factor of 20,000. For example, engineered nano-silver has been detected at levels of 2ng/m2 against a background concentration of >40µg/m2. The Aero Select is built for field use whilst providing the accuracy expected from a laboratory instrument. The 12 cascading channels minimize sampling errors caused by turbulence and wall losses and each level in the diffusion cell optimises the individual grid size used with the number of collector screens. The result of the overall design of particle size discrimination reduces time and costs associated with analytical testing depending on the application required. The convenient size and weight of the unit allow easy transportation to the sample location and a 24hour programmable timer provides the option to auto-start if a delay is needed. Sampling can be continuous or segmented for optimal data collection. An on-board pump and flow meter simplifies installation and eliminates the need for external equipment. The 12 sample stages of the Aero Select are completely accessible to the user without the need to disassemble the instrument. From arrival at the desired sampling location and loading the collection substrates, programming, setting the flow and beginning sample collection can take less than 10 minutes. Supplied with a set of diffusion and inertial sample collection substrates for use with the TEM grids, the substrate holders guarantee proper alignment and positioning, eliminating error and damage to the samples. There are no threads in Ancon Aero Select Reviews at this time.